HomeUncategorized Excite Your Current Customers by Creating WOW! 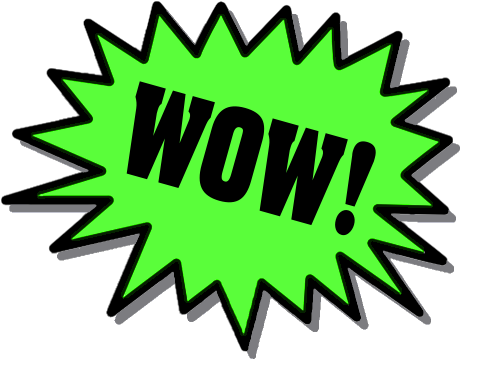 Excite Your Current Customers by Creating WOW! Many business owners consider marketing to be those activities associated with promoting their business to prospective customers. To them growth is fueled by continually enticing new buyers to purchase product or services. They believe that once an individual or business buys they become customers and thus the role of marketing has been met. Thus upwards of 90 – 95% of marketing budgets are spent on finding new customers. I hope you selected option #4. Word of mouth referrals from family and trusted acquaintances is far more likely to excite prospective customers to check you out. Typically people don’t pass along referrals unless the service they receive is exceptional. Therein lies the problem with those owners who focus the vast majority of their marketing dollars and attention on finding new clients…they don’t invest money in continually exciting existing customers. They spend little time and money focused on creating exceptional service and those WOW moments that people talk about. What would be the impact if owners re-allocated their marketing budget from 90 – 95% focused on finding new customers, to 65% on finding new, and 35% on building exceptional programs that create excitement amongst customers? Do Nordstrom’s, Ritz Carlton, Zappos come to mind? Create excitement amongst your customers and they will actively promote your business to their friends and acquaintances, and become customers themselves for life. Consider the story of WestJet Airlines. Founded in 1996, this Canadian airline adopted the mantra that “just because you pay less for your flight doesn’t mean you should get less” (website). The company’s dramatic growth (now 9,700 employees and 88 destinations) is attributable to their approach of caring for the lives of their customers. Talk about delivering a huge WOW factor, check out this video http://www.youtube.com/watch?v=zIEIvi2MuEk on You Tube. Do you think these disbelieving customers will fly any other airline to a WestJet destination? How many people do you think these excited customers told about their experience? Was WestJet’s investment in these gifts worthwhile? Heck yes. I’m guessing their return will be many hundreds times more in new profits from this single event. Think about your business. What can you do to create excitement and WOW amongst your customers? Don’t hesitate to shift marketing dollars away from traditional marketing to create WOW. If you are interested in brainstorming ideas on adding WOW to your customers, give me a call.